HAGERSTOWN, MD – The Hagerstown Suns announced today that the team will unveil its special 35th anniversary jersey on Monday, April 13 at a press conference at the Hagerstown-Washington County Convention and Visitors Bureau at 3:00pm. This 35th anniversary jersey will be worn during each Saturday home game this season and is sponsored by the Hagerstown Suns Fan Club. This specialty anniversary jersey is part of a season-long celebration for the 35th anniversary that will include at least one promotional activity and/or giveaway during each home stand of the 2015 season that will have a tie-in to the 35th anniversary celebration. The jerseys will eventually be auctioned off following the Suns game against Kannapolis on Saturday, August 29. Replicas of the jerseys will be handed out to the first 1,000 fans who enter the Municipal Stadium gates for the Suns July 11 game against Delmarva thanks to Pepsi. The Hagerstown-Washington County Convention and Visitors Bureau is a non-profit private organization whose mission is to develop and market Washington County as a viable and desirable travel destination to meeting planners, leisure travelers, and business customers. Its offices are located at 16 Public Square in downtown Hagerstown. The Suns begin the home portion of their 2015 season on Thursday, April 16 against the Lakewood BlueClaws. Two days later, on Saturday April 18, will be the first time the Suns will wear their 35th anniversary jerseys. In order to reserve your seats for either game call the Suns box office at 301-791-6266 or go to www.hagerstownsuns.com. Woodbridge, VA—The 2015 Potomac Nationals Seasonal Job Fair will be hosted at G. Richard Pfitzner Stadium on Wednesday, March 4th and Thursday, March 5th from 4:00pm to 7:00pm each evening. The Potomac Nationals Baseball Club, the premier family friendly entertainment destination in Northern Virginia, is looking for dependable, customer-service minded, and outgoing gameday team members for the 2015 season which begins on Thursday, April 9th and runs through at least Monday, September, 7th with potential playoff contests to be scheduled for the second week of September. At the seasonal job fair, P-Nats front office officials will be searching for dedicated candidates to become part-time gameday employees during the Potomac Nationals baseball season that will also work special events at Pfitzner Stadium throughout the season. The P-Nats offer seasonal positions that are perfect for school employees, students, retired persons, and others who love baseball and are looking for a fun and flexible part-time opportunity in an upbeat, exciting professional sporting atmosphere. Most weeknight P-Nats games begin at 7:05pm while Saturday night games start at 6:35pm. Sunday games in the first half of the 2015 season will be ignited with a first pitch time of 1:05pm while second-half Sunday affairs will start at 6:05pm. There will also be a 10:35am start time for the Wednesday, April 15th game and a pair of P-Nats matchups that are scheduled for 12:05pm (Thursday, July 9th and Thursday, August 13th). All departments will require gameday employees to be on site at Pfitzner Stadium well in advance of the game start time. On-site interviews will be conducted at the job fair by department heads on a first come, first served basis, and no advance appointments can be made. Job applications will be available on site, or job seekers may download an application in advance at www.potomacnationals.com to bring with you to the job fair. For online access to a P-Nats job application: once on the Potomac Nationals’ official website, under the top menu tab, “PFITZNER STADIUM,” click “Employment,” and then select the red “click here” link under the heading “Gameday Employment” to view and print a PDF file of the job application. Applications for part-time employment will not be accepted prior to the job fair. For further information on seasonal opportunities with P-Nats Baseball, contact Stadium Operations Director, Arthur Bouvier at 703-590-2311 ext. 217 or send an email to abouvier@potomacnationals.com. 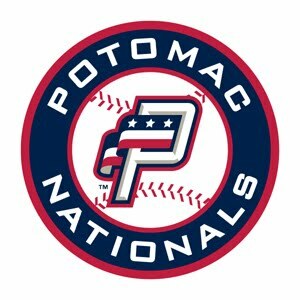 If you cannot attend the job fair but are interested in applying for a part-time position with the Potomac Nationals, you may pick up an application at the Nationals’ front office Monday through Friday from 9:00am to 5:00pm and return it to Arthur Bouvier on or after March 4th. If you choose to print out the online version of the application, you may scan and email the application to abouvier@potomacnationals.com, fax the application to 703-590-5716, or bring the application to the Potomac Nationals’ front office on or after March 4th. To schedule an interview after the job fair, contact Arthur Bouvier (see above contact information). Note: The Potomac Nationals are an equal opportunity employer. The Hagerstown Suns have been a minor league affiliate for several different teams, including the Baltimore Orioles, Toronto Blue Jays, San Francisco Giants, New York Mets and Washington Nationals, over the last thirty-five years so the anniversary promotional schedule will feature a variety of giveaways. The first bobblehead will be handed out on Saturday, June 13, and will feature former Suns pitcher Mike Mussina. See press release below for the full promotional schedule. HAGERSTOWN, MD – The Hagerstown Suns announced today their promotional schedule for the 2015 season, which is the team’s 35th anniversary season. Many of the events highlighting the promotional schedule are part of a season-long anniversary celebration, and will bring some important parts of Suns history back to life, including the highlighting of some former Suns players who have made their mark in Hagerstown over the years. Fittingly, the promotional schedule kicks off on the night of the home opener on Thursday, April 16. Dane Anthony, who threw the first pitch in Hagerstown Suns history back in 1981, will be on hand to throw out the ceremonial first pitch. Also that night there will be a ceremony in the beer garden as Antietam Brewery will be unveiling a special 35th anniversary brew and tap, which will be sold throughout the season. 2015 Magnet Schedules will be handed out to fans on opening night and throughout opening weekend, and on Friday and Saturday April 17 & 18, the first 500 fans will receive a Suns specialty beer mug that they will be able to use throughout the season to receive discounts on beer. Also, on Saturday, April 18, the Suns players will debut their special 35th anniversary throwback jerseys sponsored by the Hagerstown Suns Fan Club, as well as throwback hats that were both designed to combine several looks of the past. These will be worn each Saturday home game, and live auctions will be held for both later in the season (hats – July 11, jerseys – August 29). Another alternate jersey the Suns will wear this season will be a camouflage jersey. This jersey will be worn for most Friday home games, as well as some of the military appreciation games. On Friday, August 21, the jersey will be auctioned off following the game with all proceeds going to “Folds of Honor”, which is an organization that provides annual educational scholarships to the military families of those who have been killed or disabled while in active duty. In total there will be three bobbleheads given away during the 2015 season. The first bobblehead will be handed out on Saturday, June 13, and will feature former Suns pitcher Mike Mussina. A little more than a month later, on Saturday, July 25, a Dane Anthony bobblehead will be handed out to the first 1,000 fans. The final bobblehead giveaway of the year will take place on Saturday, August 22, and is presented by the Hagerstown – Washington County CVB. That bobblehead will be revealed at a later date. Bobbleheads aren’t the only items that fans will get to take home from a game at Municipal Stadium this season. Other giveaway items include a poster with various program covers from previous seasons (May 2), a special 35th anniversary logo hat (May 30), a pink mini-bat key chain as part of pink weekend (June 12), a poster with various baseball cards of Suns players from previous years (June 20), and a Suns logo baseball (August 8). Many of the Suns traditional weekly promotions will be back this season as well, including “Thirsty Thursday”, “Eats for Seats Tuesday”, and “Sunday Funday”. In addition, there will be new weekly promotions on Monday and Wednesday. Every Monday home game in 2015 will be a “Mega Monday”, when fans will have the opportunity to purchase four GA tickets loaded with $5.00 each to be used in the stadium for a total of $40.00 (a $16.00 savings). Or, fans on Mondays can purchase a single loaded GA ticket for a discounted price. The majority of Wednesday home games this season will be “Guaranteed WinsDay”, which means if the Suns don’t win on that particular Wednesday all fans in attendance will receive a free ticket to the next Wednesday home game. As is custom at Municipal Stadium, there will be a bunch of Fireworks shows throughout the season as well. The first Fireworks show will take place following the game on Friday, May 15. In total there will be nine Fireworks shows throughout the season, and all of them will be on Friday nights. Once again this year there will be happy hour pricing on 16-ounce cans of select domestic beers prior to every home game. The happy hour pricing will begin as soon as the gates open and will last until the first pitch is thrown. There are four games this season (May 29, June 12, July 3, and August 7) when there will be an extended happy hour, meaning the gates will open earlier than normal (4:30pm) and there will be live entertainment prior to the start of the game. New in 2015 will be theme nights to go along with each “Thirsty Thursday” game. The themes this season include college night (April 30), country night (May 14), ladies night (May 28 and August 20), golf night (July 9), 80’s night (July 23), and 90’s night (August 6). For some of the theme nights, fans who dress up in that night’s theme will receive a discounted GA ticket. Details on all of the specific theme nights can be found on the promotions page of the Suns website. Another new promotion in 2015 will be the “Weekday Matinee”. The Suns will have four weekday games (May 4, June 3, August 5, September 2) begin at 1:05pm. Fans can get tickets to these matinee games for just $5.00 (GA ticket) or $7.00 (Reserved ticket). Once inside the stadium, fans can grab a hot dog for $2.00 and/or a domestic draft beer for $3.00, making these games the perfect lunch break entertainment (and no one will tell your boss if you decide to stay for the whole game). Additional special events taking place this season will include two Education Days (April 22 and May 20), four Antietam Cable Date Nights (April 28, May 17, June 30, and August 18), a college fair (May 1), four Nora Roberts Reading Challenge games (May 2, May 3, May 16, and May 17), five military appreciation games (May 16, May 29 – 31, July 3), Craft Brew night (July 2), Kids night (July 22), two movie nights (July 12 and August 28), Christmas in July (July 25), Camp Day (July 28), First Responders night (August 7), and Teacher and School Staff Appreciation night (June 12). Lastly, the Suns organization will be hosting an inaugural Beer Tasting Festival, which will take place on Saturday, June 27 from 3:00pm – 7:00pm. There is no game that day as the Suns will be away on the road. Tickets are already on sale. For more information on all of the promotions and giveaways throughout the 2015 season and to reserve your seats at Municipal Stadium, call 301-791-6266, or go to www.hagerstownsuns.com. Woodbridge, VA—As the Potomac Nationals celebrate 30 seasons of baseball at G. Richard Pfitzner Stadium during the 2014 campaign, the P-Nats’ faithful will be treated to the most entertaining promotional schedule in the history of the franchise. The Potomac Nationals are pleased to unveil an extremely potent promo slate that is underscored by a club-record 18 fireworks shows, 15 premium giveaways including the Jayson Werth “Wolf-A-rine” and the Werth Bobble Beard, as well as P-Nats bobbleheads of former first round draft picks, Bryce Harper and Anthony Rendon, five game used and autographed throwback jersey auctions, and a visit from the Cowboy Monkey Rodeo with Tim “Wild Thang” Lepard & Team Ghost Riders as seen on ESPN’s E:60 program. The Cowboy Monkey Rodeo is an internationally recognized live animal entertainment act that features capuchin monkeys riding sheep dogs herding livestock. Lepard and Team Ghost Riders have performed at destinations around Minor League Baseball, and even at the home of the Super Bowl hopeful, Denver Broncos at Sports Authority Field at Mile High. “We are extremely excited about the entertainment we are bringing to our fans this summer at The Pfitz. The fireworks, premium giveaways, celebrity appearances, and our stadium’s 30th anniversary tributes along with the always affordable ticket options and revamped concessions items will give everyone in the family a variety of reasons to be a part of P-Nats Baseball in 2014. Last season was the best in franchise history across the board, and we know this year will be even better. I can’t wait to see our fans on Opening Day come April 8th,” says Potomac Nationals Vice President/General Manager, Josh Olerud. The quintet of throwback jerseys to be auctioned off will be replicas of uniform tops worn during the eras of the Prince William Pirates (1984-1986), Prince William Yankees (1987-1988), Prince William Cannons (1989-1998), Potomac Cannons (1999-2004), and the Potomac Nationals (2005-Present). To highlight the bridge from The Pfitz to “The Show,” the club will be unveiling a Potomac Nationals Wall of Fame up the First Base Line along the Home Clubhouse to pay tribute to former P-Nats players who have graduated to the Washington Nationals. In addition, a host of celebrity appearances featuring to be determined past and present stars from Major League Baseball, the National Football League, the National Basketball Association, and the National Hockey League are planned for the upcoming ‘14 slate. Middle School Science Day with the Potomac Nationals is circled for Thursday, April 10th and first pitch is set for 10:35am. The Nationals have also announced four Scout Nights in 2014 for area boy scouts to camp out on the Pfitzner Stadium diamond and enjoy a post-game screening of a baseball film while sleeping under the stars. Scout Nights will take place on Saturday, May 31st (6:35pm), Friday, June 13th (7:05pm), Saturday, July 26th (6:35pm), and Saturday, August 16th (6:35pm). A pair of summer camp/day care games will be hosted on Wednesday, July 30th, and Thursday, August 7th with both contests beginning at 12:05pm. Theme nights for the 2014 season include: Football Night, Hockey Night, Friday the 13th Night, Wing Fling, Man vs. Food II, Health and Wellness Night, Mother’s Day, Father’s Day, Food Truck Nights, Halfway to St. Patty’s Day, Bark in the Park Days, and many more! Military Appreciation Night, a hallmark of the Potomac franchise, will honor the armed forces community in Northern Virginia on Sunday, June 22nd at 6:05pm. The most exciting stretch of the 2014 season is Fourth of July Weekend from Friday, July 4th to Sunday, July 6th. P-Nats fans will be able to purchase “Food, Fireworks, & Fun” loaded tickets that include a pre-game picnic pass, a reserved ticket, and the biggest fireworks blast-off of the season. Also, the P-Nats will be keeping the tradition of the annual Guns vs. Hoses Charity Softball Game where members of the Prince William County Police Department battle against an area fire and rescue department. Second half fireworks shows on Sundays will return in 2014 with all Sunday games after the Carolina League All-Star Break beginning at 6:05pm and to be followed by a fireworks extravaganza. Kids will have the opportunity to run the bases after every Friday, Saturday, and Sunday game during the 2014 season. New for 2014, the always-popular, Tennis Ball Toss will be running after all 70 games where fans will be able to purchase tennis balls during the game to throw onto the field post-game in order to unlock prizes from corporate sponsors of the Potomac Nationals. 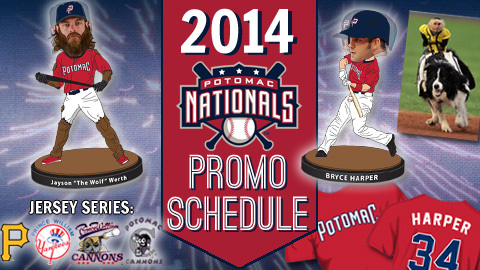 More information on the 2014 Potomac Nationals Promotional Schedule will be available soon including dates, times, and specifics for all promotions. Opening Day 2014 at Pfitzner Stadium is Tuesday, April 8th as the Nationals host the Lynchburg Hillcats (Atlanta Braves). First pitch is set for 7:05pm. For Potomac Nationals 2014 season tickets, mini plans, group tickets, picnic outings, and corporate partnerships, call the Potomac Nationals Ticket Office at 703-590-2311 or head to www.potomacnationals.com for more information. The Potomac Nationals of the Carolina League play at Pfitzner Stadium in Woodbridge, Virginia, and are the Class-A Advanced affiliate of the Washington Nationals. P-Nats 2014 season tickets and mini plans are now on sale. Sponsorship opportunities for the 2014 season and beyond are available. Plan your corporate outing now for the 2014 season to see the future stars of the Washington Nationals at The Pfitz as the P-Nats offer discounted group rates and all-inclusive picnic options. Visit the P-Nats online at www.potomacnationals.com or call the Potomac Nationals Ticket Office at 703-590-2311 for more information! For anyone in the Washington, DC area that didn’t think that they could feel any colder today…..
Woodbridge, VA—While temperatures plummet in Northern Virginia and around the country, the Potomac Nationals encourage fans to participate in the first annual two-day P-Nats Polar Plunge at Pfitzner Stadium on Tuesday, January 7th and Wednesday, January 8th from 1:00pm to 3:00pm each day. Nationals fans will have the opportunity to win full general admission season tickets to the upcoming 2014 season if they stay submerged for a total of five seconds inside the home clubhouse ice bath tub which will be wheeled into the first base dugout. Expected wind chill temperatures for Woodbridge, Virginia are scheduled to be below zero on both Tuesday and Wednesday. In addition, with a minimum ticket package purchase of $75, the Nationals are offering additional 2014 GA ticket vouchers for each degree below zero that the wind chill temps reach on Tuesday. These vouchers may be picked up on Wednesday at the Potomac Nationals Ticket Office. This ticket offer is only available for new P-Nats ticket holders, and not current ticket plan holders. Amidst the ongoing federal government shutdown which began October 1, the Potomac Nationals are giving back to government workers for their steadfast support of P-Nats Baseball. The Nationals are offering courtesy 2014 P-Nats Opening Day tickets to those government employees who have been furloughed as a result of the shutdown, in addition to the opportunity for these government workers to serve the team in a game operations role during the ’14 season as part of the P-Nats’ gameday staff. All federal government employees who have been furloughed may receive one free 2014 Opening Day ticket by showing government identification at the Potomac Nationals Front Office at any point throughout the course of the 2013 government shutdown during regular business hours (9:00am to 5:00pm). The first qualified federal government employee to apply for the 2014 gameday position in person at Pfitzner Stadium will be hired in an effort to assist in recouping compensation lost during the shutdown. Pfitzner Stadium, home of the Potomac Nationals, is located at 7 County Complex Court in Woodbridge, VA.
Woodbridge, VA—Minor League BaseballTM and Rawlings Sporting Goods Company, Inc., today jointly announced that 2013 Potomac Nationals RHP Taylor Hill has been selected as a recipient of a Minor League Baseball 2013 Rawlings Gold Glove Award® for stellar defense at his position this season. Hill, 24, joins a roster of nine MiLB players set to receive a 2013 Rawlings Gold Glove Award after honorees were selected among qualifying players from the 10 domestic, full-season Minor Leagues. These defensive wizards will receive their trophies modeled after the iconic awards given to Major League Baseball’s top defensive players during the 2014 season. Hill becomes the second-ever Washington Nationals farmhand to secure a Rawlings Gold Glove Award after 2B Steve Lombardozzi was bestowed the honor following the 2011 campaign. Hill owned a 1.000 fielding percentage across Class-A Advanced Potomac, Double-A Harrisburg, and Triple-A Syracuse in 2013 over the course of 28 appearances and 164.2 innings. Hill did not commit a single error in 46 total chances while recording 31 assists and making 15 putouts. The control maven logged a combined overall record of (9-9) to complement a 2.95 earned run average while walking just 29 batters all season as a member of the Nationals, Senators, and Chiefs. “Since 1957, Rawlings has celebrated defensive excellence at the highest levels of professional baseball,” said Mike Thompson, senior vice president of marketing for St. Louis-based Rawlings. “I know what an honor it is for a player to receive a Rawlings Gold Glove Award, having been involved in presenting them to the winners the last two years,” said Pat O’Conner, President & CEO of Minor League Baseball. The return of Rawlings recognizing Minor League Baseball players for their defensive prowess began in 2011. The St. Louis-based company named a Minor League all-star fielding team for several years in the 1960s. The honor was known then as the Rawlings Silver Glove Award. Five players who were honored in 2012, RHP Adam Warren (New York Yankees), C Josh Phegley (Chicago White Sox), LF Derrick Robinson (Cincinnati Reds), CF Engel Beltre (Texas Rangers), and RF Marcell Ozuna (Miami Marlins) have graduated to the Major Leagues. A foursome of Big Leaguers, 1B Efren Navarro (Los Angeles Angels of Anaheim), 3B Brandon Laird (Houston Astros), CF Jordan Danks (Chicago White Sox) and RF Cole Gillespie (Chicago Cubs) were among those honored in 2011. Woodbridge, VA—The Potomac Nationals are proud to announce Vice President/General Manager, Josh Olerud has been named the recipient of the 2013 Calvin Falwell Executive of the Year Award. Voting was conducted by league general managers, club owners, field managers, and the Carolina League president. Olerud finished his 10th season in professional baseball in 2013 after eight years as General Manager of the Rockford RiverHawks of the Frontier League and following completion of his third season leading the Potomac Nationals. Originally hailing from Bloomington, MN, he graduated with a degree in Sports Management with an emphasis in Marketing at Minnesota State University at Mankato. Olerud was the most recent recipient of the Pitch and Hit Club of Chicago’s Minor League Executive of the Year in 2012. Olerud oversaw a 2013 Potomac Nationals campaign that shattered the single-season franchise record for overall attendance at Pfitzner Stadium (236,772). This was the highest attendance mark in a single Nationals’ season since 220,145 fans flocked to The Pfitz in 1998. (Prince William Cannons-St. Louis Cardinals). Olerud presided over eight sellouts at The Pfitz during the 2013 campaign and average per game attendance was 3,534 fans. In addition, the P-Nats’ patriarch led a 2013 front office team that unveiled a record number of fireworks shows, premium giveaways, and celebrity appearances which made up a truly landmark 36th season in franchise history which culminated with a Mills Cup Championship Series berth. Amidst a blockbuster 2013 season which featured a record tally of sponsorship revenue, Olerud also remained focused on the mission of keeping the Potomac Nationals connected with their local community in Northern Virginia. The Potomac Nationals raised over $100,000 in 2013 across all of their fundraising branches using the following conduits: the P-Nats’ annual hot stove banquet and sports memorabilia auction to benefit S.P.A.R.K. (Supporting Partnerships and Resources for Kids) of Prince William County, Uncle Slam’s Reading Program, a trio of community nights, featured non-profit organization nights, a slew of commemorative jersey auctions with proceeds dedicated to Make-A-Wish Mid-Atlantic, Autism Speaks, and nearby Osbourn Park High School. Also featured as part of this community initiative was the annual Nationals golf tournament in conjunction with SYA Baseball, a pair of Military Appreciation Nights in partnership with Homes for Heroes, Hope For The Warriors, and the USO; the Guns vs. Hoses annual charity softball classic, and a milestone “Hire-A-Vet” program to usher in the hiring of military veterans interested in a career within the Minor League Baseball landscape. Under the direction of Olerud, the Potomac Nationals also ran a silent sports auction at The Pfitz to directly to victims of the tornadoes that hit the state of Oklahoma back in May thanks to a partnership with the OK Strong Disaster Relief Fund. During the 2013 season, which featured a franchise record 84 wins and the best winning percentage in club history (.604), Olerud laid out the P-Nats’ red carpet for a slew of Major League rehabilitation stars from the Washington Nationals including, LHP Ross Detwiler, RHP Christian Garcia, LF Bryce Harper, RHP Ross Ohlendorf, C Wilson Ramos, RF Jayson Werth, and 3B Ryan Zimmerman to Pfitzner Stadium. Notably, Harper’s first contest as a Potomac National on June 25th garnered a capacity crowd of 8,495 fans. As a compliment to the promotional efforts of Olerud and his team to energize the P-Nats’ fan base and proliferate the mission of hosting the most fan-friendly atmosphere possible, the Potomac club used this potent home field advantage on the field to turn in the best 2013 home record in the Carolina League at (47-23). The Carolina League’s Calvin Falwell Executive of the Year Award was named in 2006 for the man who had been president of the Lynchburg club since that city joined the league in 1966. Falwell served the league as an officer, director, and representative to Minor League Baseball’s Board of Trustees. Falwell passed away at age 90 on August 20th, 2011. Woodbridge, VA—The Washington Nationals have announced 2013 Potomac Nationals OF Billy Burns and RHP Taylor Jordan as the recipients of the 2013 Washington Nationals Minor League Player of the Year and Pitcher of the Year Awards. Burns, 24, a native of Marietta, GA and a product of Mercer University (GA) selected by Washington in the 32nd round of the 2011 MLB Draft, finished his 2013 campaign with the Double-A Harrisburg Senators after being promoted from Potomac on 8/2. Burns hit .325 in 30 games for the Senators in which he scored 26 runs, walked 20 times, and stole 20 bases. The switch-hitting speedster finished as the Carolina League’s leader in stolen bases for the course of the season after stashing 54 swipes to complement the second-best batting average (.312) in the league over the course of 91 games played. Burns also led the circuit in triples (9) and on-base percentage (.422). Burns departed the Nationals with the longest hitting streak in the Carolina League this past season at 25 games and also earned the third-longest on-base streak in the league with 27 straight games reaching base safely to his credit. Burns combined to earn a .315 batting clip over both Class-A affiliates while collecting 96 runs, 12 doubles, nine triples, 37 RBIs, 170 total bases, 72 walks, and 74 stolen bases in 121 total games. Burns’ batting average registered as the best in the Washington Nationals farm system in 2013 (among hitters with a minimum of 100 games played) while he swung to the ninth best on-base percentage in MiLB (.425) and stole the third most bases in the Minor League landscape. Burns was tabbed by Baseball America as the 26th best prospect in the Washington Nationals system prior to the 2013 season. Burns was also honored as both a mid-season and year-end Carolina League All-Star during the 2013 season. Jordan, 24, out of Merritt Island, FL and Brevard Community College (FL) was taken by the Nationals in the 9th round of the 2009 MLB Draft. The crafty right-hander completed his first full season after undergoing Tommy John Surgery in September of 2011 and rehabbing that injury in 2012. Jordan is tabbed as the top 2013 pitching performer in Washington’s Minor League organization after a career season that featured a combined (9-1) record in 15 appearances and 14 starts on the Nationals’ farm this year across two levels. For the P-Nats in the Carolina League, Jordan dealt to the tune of a (2-1) win/loss ledger and a 1.24 earned run average in six starts. Following a promotion to Double-A Harrisburg on 5/9, the sinkerballer was lights out in the Eastern League logging a (7-0) record and an anemic 0.83 ERA in nine appearances and eight starts. Jordan fanned 43 batters and walked just nine men over a duration of 54.0 innings with the Senators pitching staff before making his Major League debut on 6/29 on the road against the New York Mets at Citi Field in Flushing, NY. In his first start in the “The Show” against the Mets, Jordan tossed 4.1 innings and surrendered three runs, but only one earned run. Jordan struck out one, walked a pair, and gave up just five hits in a tough luck loss. Jordan pitched to a (1-3) record for the Washington Nationals while donning a 3.66 ERA in his rookie Big League campaign. According to the Washington Nationals, out of the 271 outs recorded this season in MiLB by Jordan, 210 outs, or 77.5% came via the ground ball (138) or the strikeout (72). Jordan ranked thirteenth 13th best prospect in the Nationals system by Baseball America entering 2013. Woodbridge, VA—The Potomac Nationals are delighted to announce that a new franchise single-season attendance record at Pfitzner Stadium has been set after 236,772 fans enjoyed P-Nats Baseball during a hallmark 2013 Carolina League regular season. An average of 3,534 fans per game entered The Pfitz during the Nationals’ 2013 regular campaign to be a part of the most affordable and entertaining family friendly atmosphere in Northern Virginia. The P-Nats’ record attendance number registered in 2013 shattered the previous benchmark of 220,145 set in 1998 by the Prince William Cannons (St. Louis Cardinals). In the 36th season of the Potomac franchise, The Potomac Nationals finished the Carolina League season ranked fourth in the eight-team circuit in overall and single-game average 2013 attendance. With an attendance mark of over 235,000 fans, the P-Nats have now eclipsed the 200,000 fan threshold for the eleventh time in franchise history dating back to the 1990 Prince William Cannons (New York Yankees) who accomplished this feat for this first time. On the field, the Potomac Nationals set single-season franchise records for both wins (84) and winning percentage (.604). The Nationals also owned the best home record in the Carolina League, a win/loss ledger of (47-23). Potomac captured both the First- and Second-Half Northern Division Championship titles in 2013 and beat the Lynchburg Hillcats (Atlanta Braves) in the 2013 Carolina League Northern Division Playoff Series to advance to the 2013 Mills Cup Championship. The Nationals came up short in their bid for the club’s fifth all-time championship crown falling in three straight games in the best-of-five series to the 2013 Carolina League Champion, Salem Red Sox (Boston). P-Nats fans witnessed a star-studded cast of players in 2013 including a slew of mid-season Carolina League All-Stars (OF Billy Burns, C Adrian Nieto, LHP Robbie Ray, and RHP Blake Schwartz) and a trio of year-end Carolina League All-Stars (RHP Robert Benincasa, Burns, and CF Michael Taylor). In ’13, the P-Nats welcomed a faction of Major League rehabilitation stars from the Washington Nationals including, LHP Ross Detwiler, RHP Christian Garcia, LF Bryce Harper, RHP Ross Ohlendorf, C Wilson Ramos, RF Jayson Werth, and 3B Ryan Zimmerman to Pfitzner Stadium. During their blockbuster 2013 season, the Potomac Nationals continued their mission of staying connected with their local community in Northern Virginia. After 36 seasons in the record books as a Carolina League franchise, the P-Nats remain steadfast with their longstanding tradition of giving back to people in our own backyard including non-profit organizations, local schools, and those in times of need. The Potomac Nationals raised over $100,000 in 2013 across all of their fundraising branches. As a precursor to each season, the Potomac Nationals host an annual hot stove banquet featuring special guests from the Washington Nationals and a sports memorabilia silent auction. All of the funds raised during this sports auction go directly to S.P.A.R.K. (Supporting Partnerships and Resources for Kids), a support arm of the Prince William County Public School system. Helping students reach their full potential by supporting this academic enrichment program has been a terrific way for the Potomac Nationals to usher in the baseball season for the last five years. In 2013, the Potomac Nationals sent the most viral member of the front office team, the official mascot, Uncle Slam, out into elementary schools to remind children how important reading is to their development as a young person. Uncle Slam’s Reading Program kicks off in February and runs through the month of June and has been a trademark community program for the P-Nats for the last decade. Uncle Slam rewards children for reading four books by coming out to their school and performing a live action reading of Casey At Bat along with members of the Nationals’ staff. This reading program has become an annual staple of the P-Nats’ community outreach initiatives. Over 200,000 kids have been impacted over the last ten seasons by this reading program. Following the impact of the torrential tornadoes in the state of Oklahoma, the Nationals decided to step up to the plate and help the families who had lost so much in these storms. A sports memorabilia auction on the Pfitzner Stadium concourse featured items from around the Major League Baseball, Minor League Baseball, National Football League, and National Basketball Association landscapes. One hundred percent of these funds went directly to the OKStrong Disaster Relief Fund in an effort to better the lives of the people in Oklahoma irreconcilably damaged by these twisters. All season long, the Nationals offer a unique fundraising opportunity for non-profit organizations, schools, and charity groups in which these members may purchase general admission tickets and then re-sell the tickets for a profit in an effort to raise money for their association. In addition, these groups receive special tickets with the organization printed on the face of the ticket while being featured on the video board in the outfield and over the public address microphone during the game. Also, these groups have the chance to run 50/50 raffles to further their fundraising opportunity. This is a truly a remarkable win/win program for community group leaders in Northern Virginia and the Potomac Nationals. HomeAid Northern Virginia, a non-profit started in 2001 by the members of the Northern Virginia Building Industry Association (NVBIA), took advantage of this fundraising opportunity with P-Nats Baseball for the last three seasons. A continued success for both their organization and the Potomac Nationals, HomeAid Northern Virginia is proud to report they have completed 77 projects valued at nearly $12 million. Exposure at Pfitnzer Stadium affords HomeAid Northern Virginia the invaluable opportunity to network with other businesses, give back to the homeless population, and raise funds which go back to those people who live without a home in our community. This season, in association with the Make-A-Wish Foundation’s Mid-Atlantic branch, the Nationals hosted a commemorative game used and autographed jersey auction which featured an appearance by Washington Redskins Super Bowl Quarterback, Joe Theismann. The Redskins legend visited with the Make-A-Wish kids, signed autographs for the P-Nats faithful, and most importantly granted the wishes of many children who have life-threatening illnesses. In addition, the Nationals, in conjunction with Autism Speaks and title sponsor, Lindsay Automotive, ran a special jersey auction in 2013 to benefit the non-profit group on Autism Awareness Day at The Pfitz. Autism Speaks received all funds raised in the jersey auction and had the opportunity to disseminate autism awareness information throughout the ballgame to promote understanding of this disorder. Furthermore, the Potomac franchise, in a joint partnership with a non-profit organization, holds an annual charity golf tournament. In 2013, to benefit SYA Baseball, the Nationals held their golf tourney on the links at Old Hickory Golf Club, a local private golf course in Woodbridge, VA which is a long fly ball from Pfitzner Stadium. Members of the Washington Nationals and Potomac Nationals staffs in addition to P-Nats sponsors, season ticket holders, and group leaders collaborate for a fun afternoon of golf to support a great cause. Osbourn Park High School Night at Pfitzner Stadium in 2013 was a grand success for the neighborhood public school and the Nationals. Students from OPHS came out in droves to support an evening of baseball directly engineered to benefit the schools’s athletic department. The P-Nats wore Osbourn Park Baseball replica jerseys that evening and the team ran a silent auction to decide which fans would take home the autographed uniform tops. The Nationals hope to make this an annual partnership with local high school athletic departments after a great fan response and following a sizeable contribution made to OPHS Athletics. Homes for Heroes in combination with the P-Nats Annual Military Appreciation Nights has become an invaluable partnership for both entities after another successful affiliation in 2013. Homes for Heroes is a company that affiliates with realtors, lenders, and other real estate-related service providers who offer substantial rebates and discounts to the Heroes who serve our nation and its communities every day. Our Heroes include military personnel, firefighters, law enforcement officers and others who make our communities a better place to live. Homes for Heroes was out in force on both Military Appreciation Nights in 2013 to spread the message of how our community’s Heroes can benefit from aligning with the non-profit organization. To piggyback local heroes benefiting from coming out to Pfitzner Stadium in 2013, the P-Nats hosted the second annual Guns vs. Hoses Charity Softball Game as members of the Prince William County Police Department squared off against the Yorkshire Volunteer Fire and Rescue Department. An array of police officers and fire department members and their families enjoyed a relaxing day at the ballpark while renewing a yearly rivalry by competing in softball on the very same field used by the future stars of the Washington Nationals. Both the PWC Police Department and the Yorkshire Fire and Rescue Squad were able to provide safety tips to fans, display emergency vehicles, and be recognized for the invaluable work they do while protecting our neighborhoods. In a milestone move to acknowledge the exceptional capabilities of our country’s military members to influence their community once home from war, the Potomac Nationals became the first team in Minor League Baseball to institute a hiring program specifically engineered to usher in United States military members. The “Hire-A-Vet” program was initiated with the hiring of Arthur Bouvier IV, a U.S. Army veteran, who was brought into the Potomac Nationals’ fold as the Assistant Director of Stadium Operations. Bouvier has assisted the ballclub as an all-utility man working as a troubleshooter in many different aspects of stadium operation including ballpark maintenance, grounds crew, parking, press box operations, and security. This initiative stemmed directly from one of the Army Chief of Staff, General Ray Odierno’s top priorities of assisting soldiers transitioning from the Army, as well as Army Reserve and National Guard soldiers in finding jobs. In the aftermath of a 2013 Mills Cup Championship Series appearance, it is clear that the 36th season of the Potomac franchise yielded the most fan-friendly, entertaining, and community oriented campaign in the history of the club. The on-field prowess of the future leading lights for the Washington Nationals complemented the perennial promotion by the club to make for a record-setting 2013 campaign. The Potomac Nationals of the Carolina League play at Pfitzner Stadium in Woodbridge, Virginia, and are the Class-A Advanced affiliate of the Washington Nationals. P-Nats 2014 season tickets and mini plans are now on sale. Sponsorship opportunities for the 2014 season and beyond are available. Plan your corporate outing now for the 2014 season to see the future stars of the Washington Nationals at The Pfitz as the P-Nats offer discounted group rates and all-inclusive picnic options. Visit the P-Nats online at www.potomacnationals.com or call the ticket office at 703-590-2311 for more information!